Wealth Management is one of the Quilvest Group’s two main businesses. Also active in private equity and real estate, the Quilvest Group is an independent institution with over 100 years of experience built on a solid foundation. 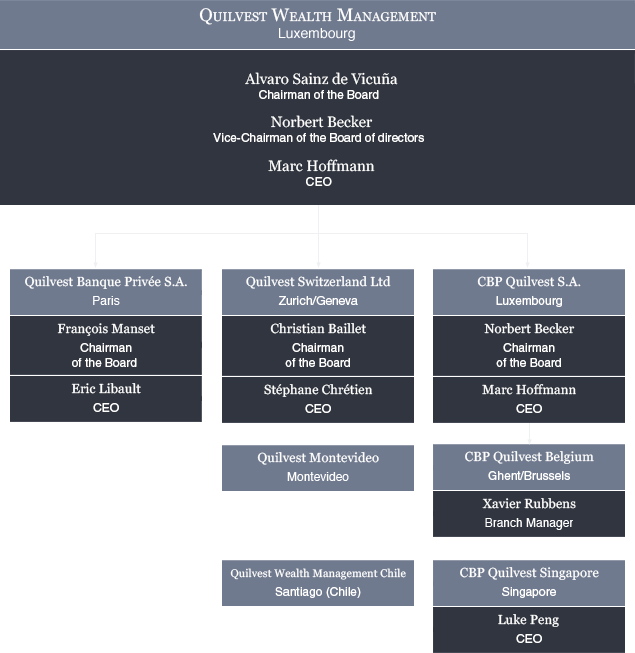 Alvaro Sainz de Vicuña is the Chairman of the Board and Marc Hoffmann the Chief Executive Officer of Quilvest Wealth Management which regroups the private banking activities of Quilvest with offices in Paris, Zurich, Luxembourg, Ghent, Brussels, Singapore, Santiago (Chile) and Montevideo.